KCKCC – Page 547 – Welcome to Wyandotte Daily! Unbeaten Jayhawk Conference leader Johnson County lived up to its No. 16 national baseball ranking Saturday by completing a four-game sweep of Kansas City Kansas Community College. While the Cavaliers improved to 12-0 in league play and 21-2 overall, KCKCC fell to 2-10 in the conference and 5-15 overall heading into a Monday home doubleheader with Dakota County Technical College at 1 p.m. The Blue Devils then return to the road, playing at Brown Mackie Tuesday and Cowley County Thursday before returning home Saturday against Cowley County, which is also 12-0 in Jayhawk play. All three twin bills are at 2 p.m. Rallying for four runs in the seventh for a 7-5 win in Saturday’s opener, JCCC completed the sweep with a 5-2 win in the nightcap after posting 9-3 and 13-8 home wins on Thursday. KCKCC jumped in front of Saturday’s opener with four runs in the second inning. Singles sandwiched around a walk by Sam Baxter scored one run, Eric Hinostroza’s sacrifice fly scored a second and Garrett McKinzie doubled in two for a 4-0 lead. However, JCCC took advantage of three walks to score twice in the third with two out and then made the most out of three walks, two singles and a double in the seventh to score four runs in the 7-5 win. 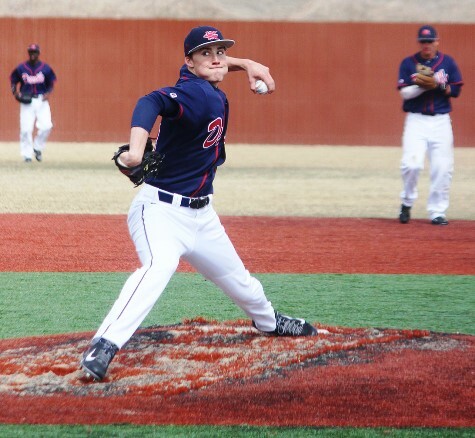 The Cavaliers took advantage of three KCKCC errors in winning the 9-inning nightcap 5-2. Only one of four runs given up in seven innings by Hunter Phillips (1-4) was earned. Sam Baxter tripled and drove in both Blue Devil runs while Mitch Glessner doubled and singled and Lucas Norton singled twice. JCCC opened the four-game series Thursday by scoring three times in the first inning and then adding five in the fourth after KCKCC had closed to 3-2 on Christian Arnold’s 2-run home run. McKinzie doubled in KCKCC’s final run in the seventh while Norton singled twice. The Blue Devils banged out 17 hits but still dropped a 13-8 decision in Thursday’s nightcap at JCCC. Norton and Baxter each had four hits and Arnold, McKinzie and Hunter Walsh two each for KCKCC, which led 3-1 and 4-2 early only to have the Cavaliers score three times in the fourth and six times in the fifth. Winner of three of four Region VI games on the road over the weekend, the Lady Blue Devils of Kansas City Kansas Community College return for the biggest home stand of the season – eight games in five days. It all starts Tuesday when the Blue Devils host arch-rival Johnson County in a pivotal Jayhawk Conference doubleheader starting at 1 p.m.
Tied for fourth in the region at 6-2 and 8-2 overall, KCKCC is just a game back of third place JCCC, 7-1 in regional play and 10-3 overall. North Central follows Wednesday for non-league games at 2-4 p.m. followed by regional foes Pratt on Friday (3-5 p.m.) and Dodge City Saturday (12-2 p.m.). Outstanding pitching by Leslie Ford and Elizabeth Seimear carried KCKCC to a 2-0, 6-1 sweep at Hesston on Friday before the Blue Devils had to settle for a split at Hutchinson on Saturday, losing 2-0 before winning 7-3. Ford allowed just three singles, striking out eight and walking one in blanking Hesston 2-0. The Blue Devils provided all the needed support in the first inning, scoring on a leadoff double by Lacey Santiago, walk, wild pitch and Hanna Barnhart’s RBI double. Barnhart, Santiago and Megan Dike each had a pair of hits in a 9-hit attack. Seimear gave up just five hits and one earned run in the 6-1 second game win. The Blue Devils again exploded in the first, scoring three times. After a leadoff single by Santiago and a walk, Mierra Morisette doubled in both and then scored on Ford’s ground ball. 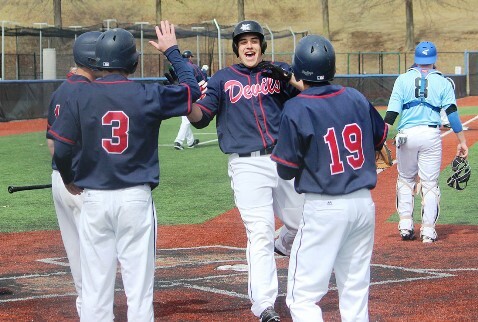 The Blue Devils added three insurance runs in the seventh on Santiago’s third single, a triple by Morisette, single by Holroyd and double by Barnhart, each of which scored a run. KCKCC outhit Hutchinson 7-6 but left seven runners on base in the 2-0 loss. Hutch scored on a leadoff single and sacrifice fly in the third and a double and single in the sixth. Barnhart was the lone Blue Devil with more than one hit. Ford came on in relief after Hutch had scored twice in the second inning and finished the 7-3 nightcap win by allowing just three hits and one run in the final 5.2 innings. Justice Scales and Barnhart each had three hits, Morisette a double and triple, Santiago two doubles and Dike two singles in a 14-hit assault. The Blue Devils again had a big first, scoring three times on four straight hits, doubles by Santiago and Justice Scales, a two-run triple by Morisette and Holroyd’s RBI single.